Personalized Mortgage Calculator Wheel Custom Printed in Bulk. Promotional, Inexpensive. Bulk Custom imprinted mortgage calculator wheels and blank wholesale mortgage calculator wheels at the lowest prices in the advertising industry. The Mortgage Calculator calculates monthly loan payments easily. 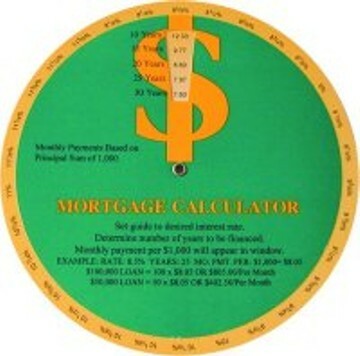 Contact us if you need a rush delivery of our custom imprinted mortgage calculator wheels. Free artwork design. Lowest prices in the USA and Canada. American clients pay no taxes. Optional Magnet for sticking on fridge: add $0.10 per mortgage wheel. Prices include your 1-color custom imprint .